Description: Even in Grundy, Alaska, it’s unusual to find a naked guy with a bear trap clamped to his ankle on your porch. But when said guy turns into a wolf, recent southern transplant Mo Wenstein has no difficulty identifying the problem. Her surly neighbor Cooper Graham—who has been openly critical of Mo’s ability to adapt to life in Alaska—has trouble of his own. Werewolf trouble. If a wolf cries wolf, it makes sense to listen, yet Mo is convinced that Cooper is not the culprit. Except if he’s not responsible, then who is? 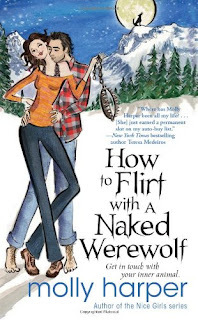 And when a werewolf falls head over haunches in love with you, what are you supposed to do anyway? The rules of dating just got a whole lot more complicated. . . . . Opening paragraph had me hooked and knew right away that this was going to be a book I would love. "Abner told me that if I moved into his cabin on the outskirts of town, my feet would always be warm and the toilet seat would always be down. I thanked him for the tempting offer. "No, actual meat, It's sort of a tradition in Grundy, a macho provider thing. They want to show you that they can feather your nest, so to speak. It's pretty Neanderthal of them, but sweet at the same time. When a Grundy man offers you a rump roast, it's the equivalent of asking you to go steady." "Maybe its just an overabundance of hormones, a response to a sexual starvation diet. I'd been without for so long that my body was craving the worst possible thing for me. Cooper was a carnal triple chocolate cheesecake , deep-fried on a stick." I listened to this one on audiobook and it was a riot! Well, I think your good stuff outweighed the bad - and actually I'm not sure your bad stuff was truly 'bad'! Good review. Sounds like a must read. Those quotes made me laugh :) Book looks fun.